This blog is to demonstrate the use of maven release plugin using Git, GitHub and CloudBees repository. Typical software release process entails many repetitive and mundane tasks which can be automated. These tasks include building, tagging, running automated tests, generating documentation, re-versioning, deploying generated artifact(s), rollback etc. However, in most companies, software release process varies depending on technology, product and process maturity. The software release process doesn't usually lend itself to be a "one-size-fits-all" process. That is why there is a huge debate in the community on merits and demerits of this plugin. There is a very good article by Lieven Doclo: Why I never use the Maven release plugin. I highly suggest to read that blog & relevant comments. In this article I will be sharing how to use Maven release plugin "only" for small shared components or projects where out of the box maven release plugin is sufficient. I will be using GitHub as SCM and CloudBees as artifact repository where release artifacts will be deployed. Both GitHub and CloudBees offer free usage tier which is just awesome! 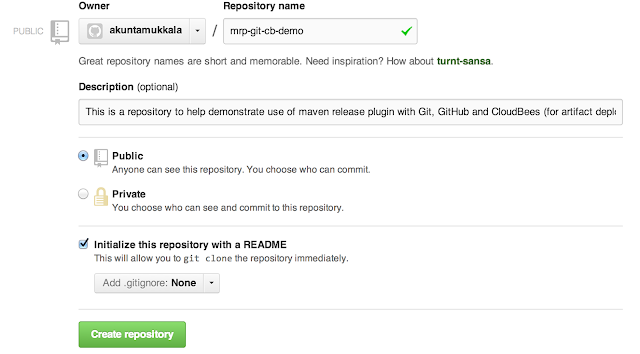 Creating a project repository: "mrp-git-cb-demo"
Clone the remote repo from GitHub. Ashwinis-MacBook-Pro:mrp-git-cb-demo akuntamukkala$ git add . Ashwinis-MacBook-Pro:mrp-git-cb-demo akuntamukkala$ git commit -m "first commit"
Writing objects: 100% (16/16), 1.63 KiB, done. The last commit is now visible in master branch at mrp-git-cb-demo repo at GitHub as shown in the following screenshot. 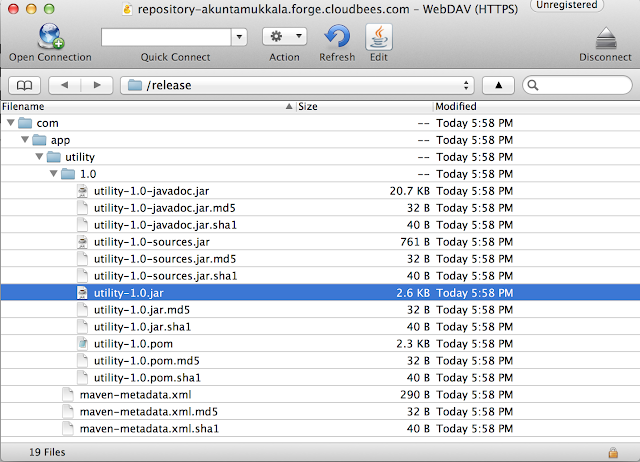 Edit Maven's settings.xml so that Maven is aware of CloudBees release and snapshot repository credentials. When you create an account at CloudBees, you get 4 free online instances JFrog Artifact Repositories (backup, private, release, snapshot). 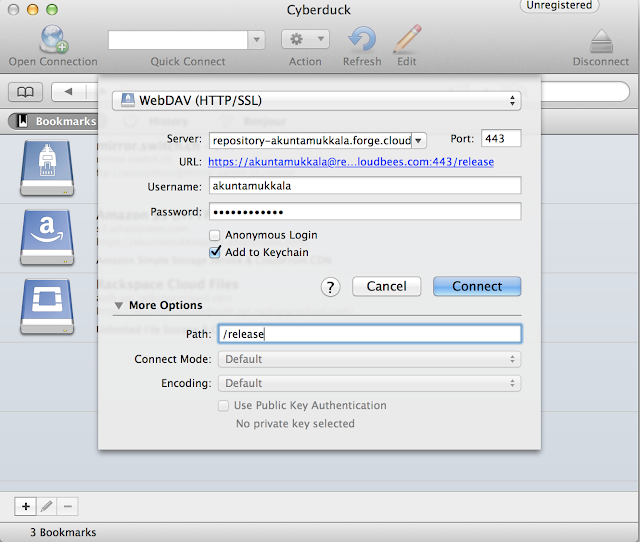 The repository access is restricted by your CloudBees account user name and password. In my case it is "akuntamukkala" and "canyouguess?!" respectively. The following is a screen shot of CloudBees account showing release repository details. Please note that this repository is accessible using WebDAV. We need to now configure Maven installation to be aware of the CloudBees release and snapshot repository access credentials. Locate the settings.xml in Maven in MVN_HOME/conf directory and add the following XML snippet in the "servers" node. Let's see this in action by running the maven release plugin prepare goal. Oops! As you just noticed, an error occurred. This is due to the fact that there are uncommitted changes to pom.xml file. We need to ensure that there are no pending changes and all changes are pushed to GitHub repository before running maven release plugin's prepare goal . Hmm..there is release.properties file generated by the previous execution of maven release plugin's prepare goal. We need to clean up to go back to a state prior to running prepare goal. Here is where maven release plugin's "clean" goal comes into play. Ashwinis-MacBook-Pro:utility akuntamukkala$ git add . Ashwinis-MacBook-Pro:utility akuntamukkala$ git commit -m "scm, distribution management, release plugin config"
Writing objects: 100% (4/4), 1.17 KiB, done. Looking at the above logs from release:prepare execution, we can see that project version has been updated to 1.1-SNAPSHOT and release pom with version 1.0 has been tagged "utility-1.0". All of these changes have been made on local repo and pushed to GitHub. The following GitHub screenshot shows tag "utility-1.0"
Let's see the pom.xml in the utility-1.0 tag in the following screenshot. Please observe that release version is 1.0. This is going to be used when maven release plugin's "perform" goal is executed. More on this later. What if we need to rollback the changes made during "prepare" goal execution? This could happen because of many reasons: there is always that one more bug that needs to go in this release, release gets pushed by business folks or QA reveals a critical bug etc. I mean we have all seen these situations at some point. So we decide to rollback using maven release plugin's rollback goal. This works fine...except for the fact that it does not delete the "utility-1.0" tag in the repo at least as of this writing. Rollback reverted the changes so master branch's pom.xml contains version 1.0-SNAPSHOT. For the rollback to have executed, it is vital to have release.properties file. If that was missing, then this operation would have failed. pom.xml in master branch reveals that version is reset to 1.0-SNAPSHOT as shown in the screenshot below. Here you may notice that the "utility-1.0" tag still remains in GitHub repo. This feature of rollback where the release tag needs to be deleted has not been implemented as of this writing. Refer http://maven.apache.org/maven-release/maven-release-plugin/examples/rollback-release.html for more details. Let's resume the release process again by first executing the prepare goal again. Now let's execute the perform goal of release plugin to see the following tasks being performed. [INFO] [WARNING] 'build.plugins.plugin.version' for org.apache.maven.plugins:maven-javadoc-plugin is missing. [INFO] [WARNING] 'build.plugins.plugin.version' for org.apache.maven.plugins:maven-deploy-plugin is missing. [INFO] [WARNING] 'build.plugins.plugin.version' for org.apache.maven.plugins:maven-source-plugin is missing. [INFO] [WARNING] It is highly recommended to fix these problems because they threaten the stability of your build. [INFO] [WARNING] For this reason, future Maven versions might no longer support building such malformed projects. The following screenshot shows the contents on release artifact repository. We have seen how to use maven release plugin's prepare and perform goals in a project using Git, GitHub and CloudBees JFrog Artifact Repository. Maven release plugin is feature rich and there are so many options that I haven't discovered . For most part we have seen the plain vanilla use case here. I'd love to hear about your use cases where you found maven release plugin useful and where you did not. As always, any comments, suggestions to improve content are most welcome. Thanks again for your interest! Long live open source!